The 2018-2019 Reagan Early College Student council, showed tremendous community spirit by helping with the 2018 Coats for Kids, students were complimented by the volunteer staff for their positive, hard work they did during the whole process. 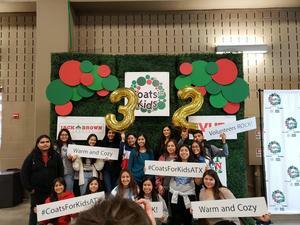 The organization, which has been helping the families of Austin for more than 30, has done a great job of allowing the students of Reagan High school the opportunity to come and show their community that they are willing to help in any capacity. Students working on holiday decorations during some downtime, never a dull moment.